Are their cruises for non-smokers? Is tipping required on all cruise ships? Will I become seasick on my cruise? Why should I take a cruise when I can go to a hotel resort? Does the United States have a cruise ship? What can you do on short cruises of two to five days? What are the most popular destinations on a short itinerary? What about the size of the cabins? What does "all inclusive" mean in terms of cruising? Can I get married on a cruise? Are river cruises a fad or for real? Can I cruise into the Millennium? Can I cruise with non-smokers? Carnival Cruise Line's PARADISE is the world's first smoke-free cruise ship. 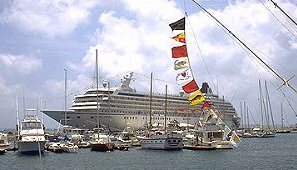 Her debut is December 6, 1998, sailing from the Port of Miami every Sunday on seven-day alternating eastern and western Caribbean itineraries. Other lines will be following this marvelous trend. Is tipping required on all cruise ships? Seabourn Cruise Line, Holland America Line and Windstar Cruises, a Holland America Line Company, are among lines with a "tipping not required" policy. Travel Assist believes that excellent service should be rewarded regardless of the policy. Most cruise lines have a per day tipping policy for restaurant waiters and cabin stewards. Read the brochures carefully. Will I become seasick on my cruise? Today's cruise ships are stabilized for comfort. Cruise lines want your vacation to be a happy one, and they also want your repeat business. Few passengers have motion sickness when sailing. There is a doctor onboard and motion sickness remedies for those who become queasy. Sometimes even the bartender has a magic potion in his bag of tricks. Why should I take a cruise when I can go to a hotel resort? Many cruise ships are floating hotel resorts. Your cabin is your nest, your restaurant waiter a familiar face. This, coupled with ongoing onboard activities, shore excursions and the joy of experiencing a variety of ports is hard to top. For example, the GRAND PRINCESS, on it's 12-day summer cruises from Istanbul to Barcelona, calls at Ephesus, Turkey; Athens, Greece; Venice, Naples/Capri, Florence/Pisa, Italy; and Monte Carlo, Monaco on the French Riviera. Four countries and Monaco on a 12-day cruise makes for a spectacular vacation. Passengers can choose what they want when they want. The ship has a 24-hour bistro, the largest casino at sea, three entertainment showrooms, a virtual reality center, the first Southwestern restaurant afloat and a nightclub suspended 150 feet above the sea, accessible by a moving walkway. Does the United States have a cruise ship? Yes. American Hawaii's classic U.S. flag ocean liner, the S.S. INDEPENDENCE, is the only ship that cruises exclusively among the Hawaiian Islands year-round. The ship departs from Honolulu each Saturday evening, features the friendly service of an American crew and is ideal for families. What can you do on a short cruise of two to five days? CLIA, (Cruise Lines International Association), a representative for 24 North American cruise lines reports that it is a great way to experience new destinations and perfect for a quick getaway with all the cruise amenities of a longer voyage. The passengers are younger, the ambience festive. What are the most popular destinations on a short itinerary? The Bahamas, west coast of Mexico, Mediterranean and the Caribbean. Other regions of interest are the Mississippi River, Hawaii, Canada/New England, the West Coast and Bermuda. Transatlantic crossings and party cruises are also available in shorter lengths. Give me an example of a short cruise. Royal Caribbean International offers a wide selection of short cruises, including three-and-four-night Bahamas sailings from Miami and Port Canaveral. Ports of call include St. Thomas, ST. Maarten and St. Croix in the southern Caribbean, and Nassau and Cococay, the line's own out-island, in the Bahamas. From Los Angeles/San Pedro you can sail on RCI and Carnival to Catalina Island and Ensenada, Mexico on weekend party cruises. Following the path of the old SS Catalina Steamship. What about the size of the cabins? Read the brochure and then measure. Surprises in travel are not always welcomed. Cabin size depends upon the booking and category. If you are independently wealthy, not to worry. You get what you pay for. First time cruisers are often taken back by the compact design of cabins which should not be compared to hotel rooms. Every inch counts and it helps if you are tidy and pack light. Inside cabins are generally small but ideal if watching your pocket book. On short cruises party animals use cabins to sleep and shower. Outside cabins with a balcony open the space to a broad horizon and should be considered for longer cruises. Bathrooms are compact and the toilet or head can be as noisy as a jet engine. The new DISNEY MAGIC cleverly has two bathrooms in many of their staterooms, a first in the industry. What does "all inclusive" mean in terms of cruising? All inclusive generally includes the cruise fare, dining and entertainment, enrichment programs and the work-out rooms. Some packages include air fare, port taxes and transfers. Shore excursions are purchased on an individual basis. Wine and drinks are also added to your tab. Can I get married on a cruise? Yes. Princess Cruises of Love Boat fame, is the first to feature an ocean-going wedding chapel. The GRAND PRINCESS offers the only at-sea wedding program allowing passengers to be married by the ship's captain. What about gentlemen hosts? Crystal Cruises, Royal Olympic Cruises and others have carefully selected mature male hosts who graciously dance with female passengers and serve as social hosts. Romance is out. Graciousness is in. Are river cruises a fad or for real? River and canal cruises have long been a popular segment of cruising. Uniworld, dating to 1976, a pioneer in affordable, high-quality river cruises, offers cruises and tours in some of the most fascinating parts of the world including Europe, Russia, China, India and Nepal. The intimate vessels built for riverways, offering 43 itineraries on 15 ships, was one of the first Western companies to charter ships through Russia. Look at Canadian River Cruise Vacations\St. Lawrence Cruise Lines, based in Kingston, Ontario, Canada. Can I cruise into the Millennium? Many cruise lines have published elaborate Millennium schedules. Cunard's "The Art of Cruising, 1999," is filled with gala Millennium cruise offerings.